Jefferson City, MO - Saying that Jordan Brown had a good year outdoors is akin to saying the MU Tigers football team had a good season. The only downside to the 14-year-old Cuba, Missouri, resident’s envy-inspiring string of 2007 successes is that he might never have another year that measures up. Brown’s year got off to a good start when he killed a nice gobbler during the spring turkey season. He was excited when the month-long fall turkey season opened Oct. 1, but his wildest dreams fell short of what actually happened. The pair of gobblers weighed 21 and 22 pounds. If Brown thought his season couldn’t get any better, he was mistaken. He started opening day of the November Portion of Firearms Deer Season by shooting a doe, then bagging a 10-point buck, both before sunrise. While the buck isn’t record-book material, it is trophy most hunters would cherish. Was Brown’s banner year over? Not quite. He, his father, Bruce Brown, and two friends were gigging on the Big Bourbeuse River in northeastern Phelps County four days before Christmas when he sank his spear into a big fish. Jordan thought it was a carp. He probably would have cleaned and eaten the fish, but for his father. Bruce Brown, a retired Conservation Department forester, pulled out a copy of The Fishes of Missouri, the authoritative reference book by William L. Pflieger, PhD. The best Bruce could make out, his son’s fish was a silver redhorse, a smaller species than the river redhorse. The book said silver redhorse typically weigh between .5 and 3.5 pounds. Pflieger noted that the largest one previously documented in Missouri measured 27 inches from snout to tail and weighed 9 pounds, 1 ounce. Bruce knew they had killed a couple of similar fish in the 6-pound range in the same area last year. Jordan’s fish seemed bigger, so they decided to keep it and weigh it. It tipped the scales at weighed 9 pounds, 13 ounces. 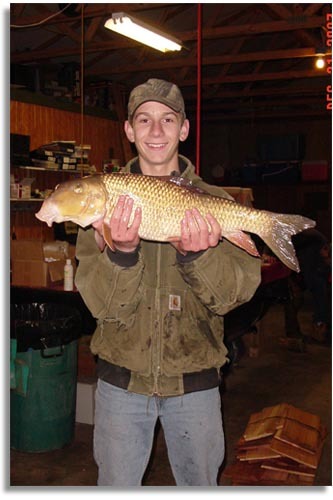 The Conservation Department did not have a silver redhorse registered in the “Alternative Methods” category, which covers gigging, snagging, trotlining and everything else other than fishing with a pole, line and lure. Consequently, all they had to do to secure the record for Jordan was get Fisheries Management Biologist Jennifer Guyot and Conservation Agent Rob Brandenburg to confirm the fish’s species and weight. The fish fell just 1 pound, 10 ounces short of the 1985 Wisconsin catch recognized as the all-tackle world record by the International Game Fish Association. Questions, answers and tips about catfish fishing can be found in our Fishing Discussion Forums.